Yes! I want my teaching to be more rigorous! Yes! I want to be purposeful and intentional with my instruction! Yes! I know my data can help me do that! Okay, but WHAT data should drive my instruction? Where am I driving my instruction anyway? What does that look like in my classroom? And that’s when ClassMax was born. As an educator, we know our students well enough to know when they are struggling with a concept. But what do we do with that knowledge? It isn’t DATA, but, darn it, I’ve seen that kid struggle and I know they aren’t mastering the topic yet. With ClassMax, teachers are able to quantify what they see in their classrooms, turning those 100 times a day when we think to ourselves, “Matthew is really struggling,” or “Claire needs some extra help with that skill” into actual, reportable data right there on the spot. No waiting for a test score. No waiting even for an exit ticket at the end of the period to tell me what I’m already going to know. I create my own data as I teach. It is in this instantaneous, organic data collection that using data to drive instruction can really come to life. Let’s look at a real example. Let’s say that I just taught a lesson on the water cycle to my 2nd grade class (P.S. In real life, I was a middle school Language Arts teacher, so if I botch this example, just go with it…). I teach my awesome lesson and then turn my students loose with some sort of academic task. As they are working, I am walking through the room, answering questions and collecting data through the progress monitoring feature of ClassMax. I can assess an entire class of students in under two minutes with ClassMax. TWO MINUTES. Which means that in two minutes, I have quantifiable data to drive my instruction. So, I have assessed my students and now, merely five minutes into their assignment, I have data to use to drive my instruction. I’m going to run a report on the standard I am tracking right there on the spot as my students are working. Here’s the standard I am teaching (I realize this is a language arts standard, but we are wearing our imagination hats, right? Go with it…). If I click the standard, it is going to show me who is where on their progress. And, remember, this is from the data I just collected five minutes ago. It’s fresh meat, teacher friends. In less then five minutes, I have assessed my students and now have the data in my hand so immediately drive my instruction. From that two minute data collection in class, I can immediately start addressing learning needs during my lesson – not after the fact. I know that I should probably go sit one-on-one with my red student because she is struggling more than her classmates. I know that I should probably pull my yellow scoring students into a small group for a little reteaching or to clarify some misunderstandings. I even know who is wasting their time by doing the current assignment and is already ready to move into an enrichment activity. THAT is using data to drive instruction, teacher friends. It is collecting realtime data in your classroom from what you are seeing and hearing as an education professional and then immediately using that data to change how you are reaching students. There is no waiting for quiz or test results to come back. There is no analysis in a big spreadsheet. There is no creating separate lessons. It is simple assessing students where they are and adapting your instructional practices accordingly, in realtime. 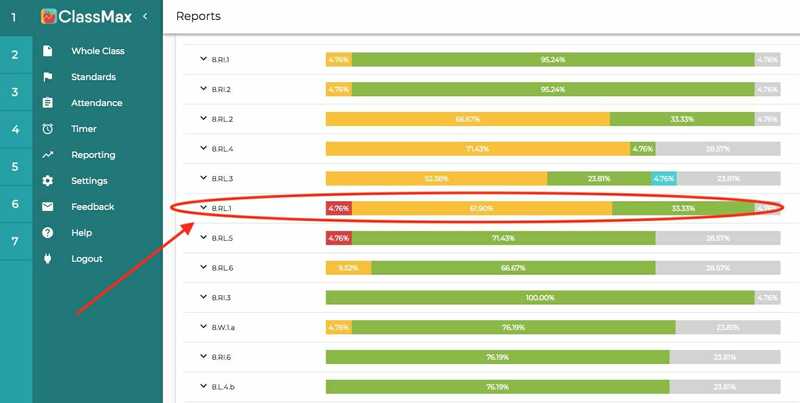 While assessment data is highly valuable in a classroom and should not be replaced or undervalued, ClassMax allows for an additional layer of assessing that is teacher-driven and instantaneous. It is a powerful tool to have in your hands, teacher friends. What will you do with it? Are you a teacher interested in an individual teacher account? Click here for information and pricing! Are you an administrator or district personnel interested in ClassMax for a school or district? Click here for site licensing information and pricing! This entry was posted in ClassMax, General Information, Progress Monitoring, Reports and tagged Data Driven Instruction, Progress Monitoring, tracking student progress.